100 years after Newton, Johann Wolfgang Goethe (1749-1832) examined the problems of colour and although his Theory of Colours was intended to attain «a more complete unity of physical knowledge» by including all branches of the natural sciences, Goethe approached the subject primarily to gain some knowledge of colours «from the point of view of art». 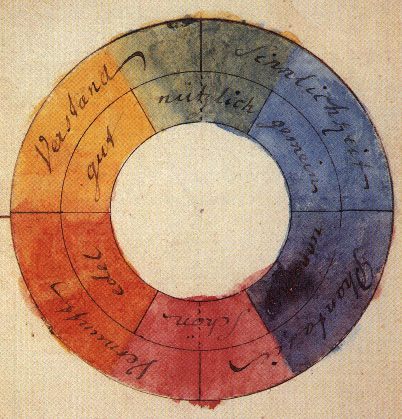 In a letter to Wilhelm von Humbolt in 1798, Goethe explained that by embarking on his History of the Theory of Colours he had also hoped to create a «History of the Human Spirit in Miniature». Goethe’s first Contributions to Optics were produced in 1791 after experiencing the difficulties encountered by contemporary artists with colouration and colour harmony at first hand on his journey through Italy. «Indeed, I heard tell of cold and warm colours, and colours which enhance one another, and suchlike», but everything «turned in an odd circle … of confusion». Between 1790 and 1823, Goethe documented the subject of colours in some 2000 pages, most of which appeared between 1808 and 1823 under the title Theory of Colours. He evolved his system from the elementary opposition of light and dark (which was not a part of Newton’s work). In his paper On the Order of Colours and Their Relationship to Each Another, Goethe establishes that, as totally pure colours, only yellow and blue «can be perceived by us without being reminiscent of something else». The opposite poles are formed by the yellow most easily compared with brightness («next to light») and the blue most related to darkness («next to blackness»), between which all other colours can be grouped. When, in 1793, Goethe sketched his colour-circle, he did not place this basic pair of yellow (giallo) and blue (blu) opposite each other but extended them into a triangle together with a red, which was originally described as purple (rosso). He described «this red effect» as the «highest augmentation» of the series of colours leading from yellow to blue, and placed green (verde), arising from the mixing of yellow and blue, opposite. 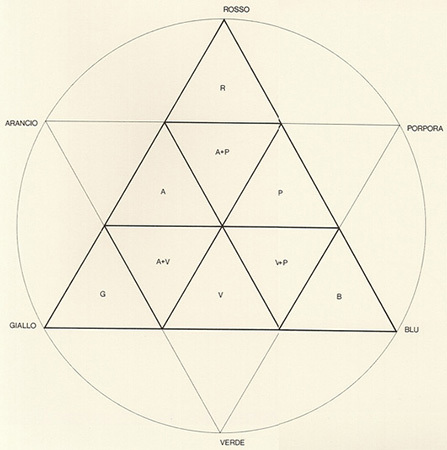 The circle is completed by an orange (arancio) on the ascending side and by a blue-red (porpora) on the descending side (often described as violet) (Original drawing of Goethe). Next to the circle, in various small triangles, we have shown a few alternative possibilities for the layout of the large triangle — similar to Joseph Albers in his Interaction of Color (1963) — in order to demonstrate an «expressive colour accord». The first case shows the series of primary colours (1.1), secondary colours (1.2) and tertiary colours (1.3); in the second case, we give an impression of what, from the «sensual-moral» point of view, Goethe explained as force (2.1), sanguineness (2.2) or melancholy (2.3). (The following paragraph will provide more on this subject.) The third case emphasises the three axes of the complementary colours: red (3.1), yellow (3.2) and blue (3.3). Finally, we accentuate brightness (4.1) and intensity (4.2). Goethe referred to the part of his circle running from yellow to red as the plus side and its continuation into blue as the minus side, and arrived at the following arrangement: the yellow was associated with «effect, light, brightness, force, warmth, closeness, repulsion»; and blue with «deprivation, shadow, darkness, weakness, cold, distance, attraction». It is suggested that Goethe’s intention was mainly to ascertain the «sensual-moral» effect of individual colours «on the sense of the eye … and the eye’s imparting on the mind». He understands colours mainly as «sensual qualities within the content of consciousness» and thus transfers his analysis into the area of psychology. The colours on the plus side «induce an exciting, lively, aspiring mood». Yellow has a «splendid and noble» effect, making a «warm and comfortable» impression. The colours on the minus side, however, «create an unsettled, weak and yearning feeling». Blue «gives a feeling of coldness». With his insight into the sensual-moral effect of colours, Goethe comes nearer to his initial objective: namely, to bring order to the more chaotic, aesthetic aspects of colour. He places colouration within the separate categories of «powerful», «gentle» and «radiant», and propounds the following ideas: the powerful effect will arise if yellow, yellow-red and purple predominate, with the gentle effect mainly being determined by blue and its neighbours. If «all colours are in equilibrium», an harmonious colouration will arise which can produce radiance and also pleasantness. (The philosopher Ludwig Wittgenstein, by the way, notes in his Remarks concerning colours: «I doubt that Goethe’s remarks about the character of the colours would be much use to a decorator, let alone a painter»). Whoever should compare this short description of Goethe’s Theory of Colours with Newton’s preferred approach will soon become aware of two completely different attitudes to the one, single theme. These attitudes do not oppose each other, however; they complement each other — alone, neither of the systems can cover all aspects of colour completely. Their relationship can best be described as «complementary», implying a deeper meaning here than the term used for colours. Newton’s analysis of colours is to be seen as complementary to Goethe’s. Neither of the theories is wrong; each independently reproduces a valid aspect of our world, and substantiates the other. Goethe is only wrong when he maintains that Newton was misled, indeed «twice and three times over». In order to bring life to this idea of complementarity, we can compare the English scientist’s and the German poet’s beliefs: what for Newton is simple — pure blue, for example, being light with one wavelength («monochromatic light») — is complicated for Goethe, since pure blue must first of all be prepared by an extravagant means and is therefore artificial. In contrast, white light is simple for Goethe, since it exists completely naturally and without effort; Newton, on the other hand, sees in white light a mixture of all colours. White light is not simple for Newton; it is a combination. Thus, what Goethe regards as a unity, a whole — «das Schauen» — disintegrates with Newton (and his successors) into many parts. For Newton, the act of viewing colour commences with a reaction in the eye which, to be understood, requires more detailed knowledge of the retina; the circuit of nerve cells; the different stages which signals pass through on their way to the brain; and the regions in the brain which, through the generation of electrical signals, create sight. The essential complementarity of both colour theories becomes evident when we consider the role of the subject — the human being. While Goethe, as a matter of course, views the human being as central, Newton omits him totally. Here, two complementary truths meet: Goethe presents the direct truth of sensuary perception as a counterbalance to the remote truth of Newton’s science; Newton distances himself from a notion of the world («the pure human sense» as Goethe would have it). Indeed, Goethe expressively employs such a notion to obtain clarity about the nature of colours. Something troublesome arises here, creating a certain tension. The opposite of one deep truth (in this case from Newton) is not something which is wrong; it is another deep truth (that of Goethe). 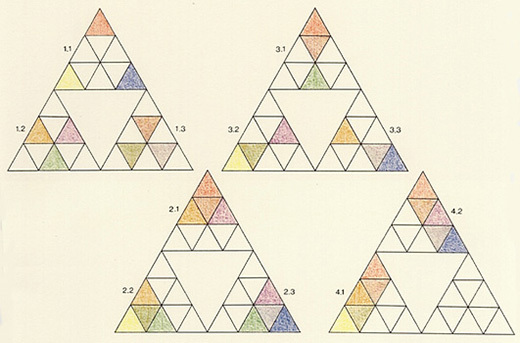 Date: The problem of colours had occupied Goethe from 1791. His work Theory of Colours appeared in 1810. Bibliography: J. W. von Goethe, «Theory of Colours», Tübingen 1810; J. W. von Goethe, «Geschichte der Farbenlehre», parts I and II, Munich 1963; J. W. von Goethe, «Theory of Colours», didactic volume, Munich 1963; W. Heisenberg, «Die Goethesche und die Newtonsche Farbenlehre im Lichte der modernen Physik» in Gesammelte Werke, Volume CI, Munich 1984, pp. 146-160; John Gage, «Colour and Culture, Practice and Meaning from Antiquity to Abstraction», Thames and Hudson, 1993, pp. 201 – 205.